CHEYENNE – At the Wyoming Cattle Industry Convention & Trade Show, held in Cheyenne June 5-8, the Wyoming Stock Growers Association (WSGA) honored a number of outstanding agriculture advocates. Patricia Hatle was named the Outstanding Range Professional and Doug Thompson was honored as Guardian of the Grasslands. The 2013 Leopold Conservation Award winners, the Padlock Ranch, were also recognized. 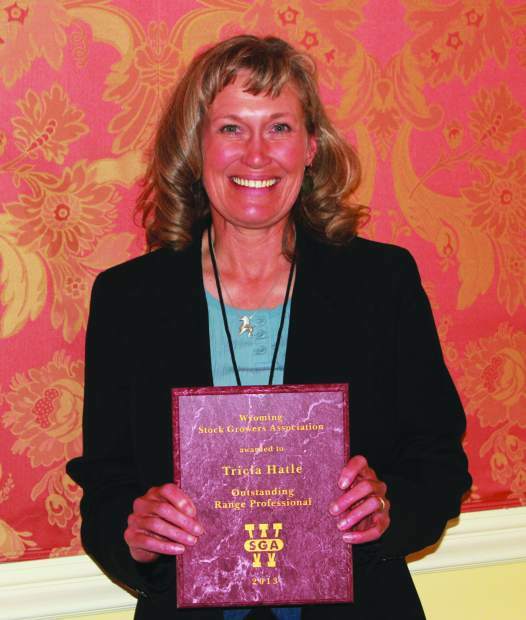 Patricia Hatle was recognized and awarded the Outstanding Range Professional Award from the Wyoming Stock Growers Association. This award is given in recognition of the valuable contribution to the livestock industry made by range professionals who exemplify high professional standards coupled with a dedication to building strong working relationships with livestock producers. 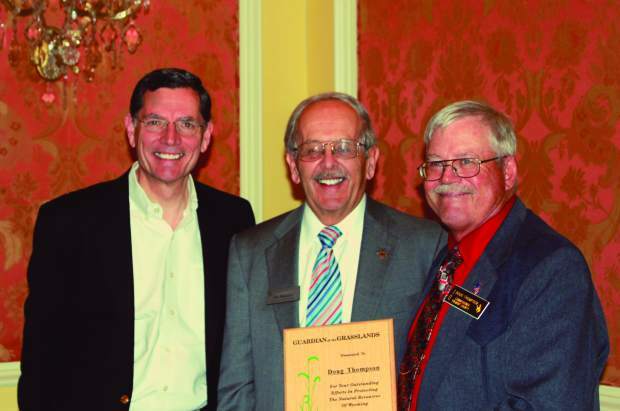 Doug Thompson received the Guardian of the Grasslands award for his continued work and dedication to protect our natural resources in Fremont County. The award is given for outstanding efforts in protecting the natural resources of Wyoming. "The Annual WSGA Awards Luncheon is an event to which our members look forward. It is our opportunity to recognize and reward those who provide industry leadership in cattle production, resource stewardship and advocacy on behalf of Wyoming's ranching culture and economy. This year's honorees join a distinguished list of Wyoming individuals who have contributed in diverse ways to the continued strength of agriculture in Wyoming," stated WSGA Executive Vice President Jim Magagna. The 2013 Leopold Conservation Award was awarded to Wayne Fahsholtz, President and CEO of Padlock Ranch and his wife Judy Fahsholtz. The Padlock Ranch is owned by the Homer Scott family and has been operating since 1943. Scott and his wife Mildred started the operation on 3,000 acres and continued to grow the property to its current size. On 500,000 acres spanning the Wyoming – Montana border, Padlock Ranch operates a sustainable and profitable cattle operation raising natural beef. The $10,000 Leopold Conservation Award, which is presented as the most prestigious award within the Wyoming Stock Growers Association's Environmental Stewardship Program, recognizes Wyoming ranchers who demonstrate outstanding, sustainable management of natural resources. The Leopold Conservation Award is presented in honor of famed conservationist and author Aldo Leopold, who called for an ethical relationship between people and the land they own and manage.